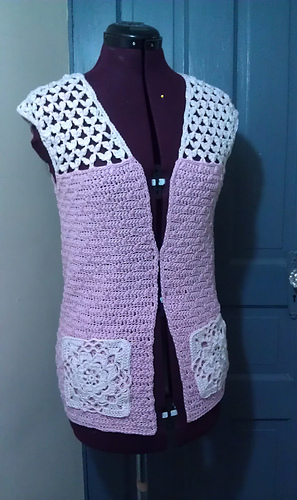 Crochet grannies take a supporting role as pockets on this long, textured open vest worked in lace and solid stitch. Add this bit of color to any out­fit-it would be great with shorts and a tee! Finished Size: 34¼ (37¼, 40¼, 43¼, 46¼, 49¼)“ bust circumference. 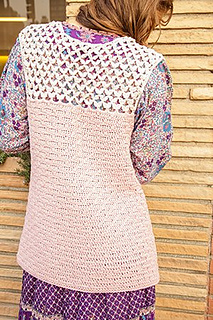 Garment shown measures 34¼”, modeled with ¼“ ease. Garment is meant to be worn with 2” of ease. Yarn: Plymouth Yarn Cleo (100% mercerized pima cotton; 125 yd 114 m/1¾ oz 50 g): #0133 peony (A), 2 (2, 3, 3, 3, 3) hanks; #0136 pink (B), 6 (7, 8, 9, 9, 10) hanks. Hook Sizes: 7 (4.5 mm) and H/8 (5 mm). Adjust hook size if necessary to obtain correct gauge. Notions: St markers (m); blocking pins and spray bottle; yarn needle. Gauge: 8 dc-cl = 4” and 8 rows = 4½“ in lace patt with smaller hook; 16 sts and 16 rows = 4” in rib patt with larger hook.